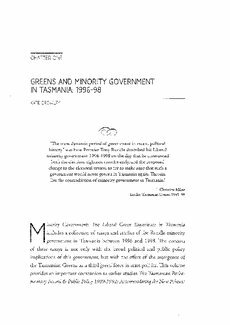 Minority Government: The Liberal Green Experience in Tasmania includes a collection of essays and studies of the Rundle minority government in Tasmania between 1996 and 1998. The concern of these essays is not only with the broad political and public policy implications of this government, but with the effect of the emergence of the Tasmanian Greens as a third 'green' force in state politics. This volume provides an important companion to earlier studies The Tasmanian Parliamentary Accord & Public Policy 1989-1992: Accommodating the New Politics? (Haward and Larmour 1993), and The Greening of Government: the Impact of the Labor/Green Accord on Government in Tasmania (Larmour 1990). Each volume has added to the understanding of contemporary governance at the sub-national level as Australian politics moves 'beyond the two party system' (Marsh 1997), with Tasmania offering a unique history of greensupported minority governments. In Tasmania and elsewhere, the experience of minority government had predominantly involved defectors from major parties or individual independent members of parliament holding the balance of power (Moon, this volume). However, over the last twenty years in Tasmania, and now at the federal level, there has been a greening of minority government and politics that sets an international precedent. That the Tasmanian Greens would support a conservative Liberal minority government (1996-98) on the basis of new co-operative politics also sets a precedent that is documented in this volume.